Click to viewWhoa, the iPhone just got GPS. Well, it's actually using peer-collected GPS data linked to cellular tower, which Navizon describes as peer to peer location detection. Either way &mdash it actually works. 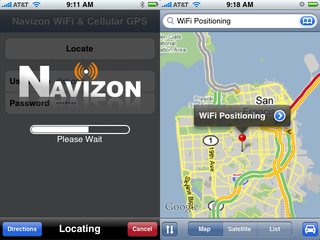 This morning, the Navizon GPS app showed up in Installer.app. After creating a username and login (get this: email NOT required), the app started up, taking about 30 seconds to find my location accurate within a few hundred feet &mdash good enough to use as a starting point for driving directions. Then it pushes your coordinates, by latitude and longitude, to many, many, many decimal places of degrees, to the map application. Some people with a GPS device collect the location information of cell towers and wifi access points. Then they share it with the rest of the network and everyone else who doesn't have a GPS device can then simulate a Virtual GPS thanks to the data collected by others. This is why we call it Peer to Peer Positioning.